Can the foam on the inside be replaced. Yes, the Foam liners are replaceable. I was fitted for an airselect elite boot yesterday at my doctors office for Haglunds deformity. My shoe size is a 7 1/2 to 8. I was fitted with a medium boot. It seems way too big. My toes are a full 2 inches from the tip of the boot and the velcro fastens across the top of my foot and across part of my toes. It makes the plastic and padding push on the top of my toes especially my big toe. I am also very short. 4'10". The boot comes up to my knee. So when sitting the back of the boot actually rests against my thigh. Overall it just seems huge on me. I was also informed once I walk out of the office its non returnable. That doesnt sound right if I was inproperly sized. What is the correct fit? Thank You. A Women's 7 ½ to 8 is a Small in the Aircast AirSelect Standard brace. I've been wearing one of these for a few weeks post ankle surgery. Per the surgeon it gets worn 24 hours a day, with the only times off showering and icing. The inside of the boot is starting to stink. Is there anything I can put in it to remove the odor? It's not bad at this point but I'd like to stay ahead of it since I'll be wearing it for at least a month and I can't take it off long enough to wash the liner. You should wear socks fiirst off to try to prevent sweat from getting in the boot. What is the length of time a person should wear the boot? I have a broken ankle and had no weight bearing for 6 weeks in a different boot now I have this boot and I've been using it for two weeks, my boss wants me to return to work. The Dr wants me to start weaning out of this boot. It's a workman's comp case. The exams I had 2 weeks ago showed I was healing but not completely. I'm worried if I stop wearing the boot will my fracture not heal property? 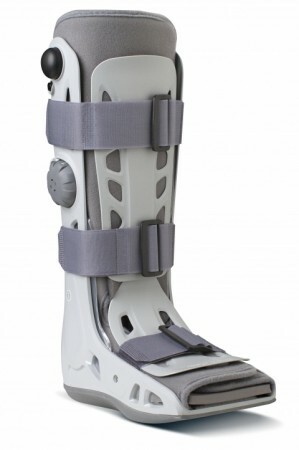 The desicion to stop wear the boot is soley up to your medical professional. If I wear a size 13 shoe which size should I get, since I am on the cusp of l and xl? If she is having irritation on her bunioun it is possible that the boot is not wide enough for her foot. A different boot might need to be used, something that does not have a shell like out MaxTrax Boot. Can you order just the foam insert for the Aircast, Airselect standard size XL, and is you can what is the cost. I need a brace to wear during the day for plantar fascits. Will this brace work for that and stretch my foot? How is this one different from the Aircast XP Walking Brace? The Air Select Boots were designed to be lighter than the older Aircast Boots, with a better sole and lower height compared to the AirCast XP. The Air Select Standard has only two air cels and the XP has four. The XP uses a hand help pump to fill the aircels and the Air Select Boots have the pump already installed on the boot. Does the same boot work for the left and right foot/leg? What is the heel height of the medium boot? My back is hurting due to my uneven gait and I want to purchase a shoe with the appropriate heel height for my other foot. Thanks! I bought this as a result of breaking some bones in my foot and needing full leg support to help the pain in my leg muscle also. I find it very easy to put on, the side 'pumps' work effortlessly to achieve the support l need and, apart from the extra weight on my leg, l can wear it all day and night without too much inconvenience. A First Class product at a reasonable price. I love this walking boot. It is easy to don. It is easy to clean and it is very comfortable. I have no problem wearing it day and night. Just be sure to get the right size which is very important. The dual air chamber technology makes for a custom fit that you can change at any time for maximum support and comfort. The air bladders looked a little thin to me when I first got the boot but I have not had any problems with them so far after 2 months of solid wear. The only reason I gave it 4 stars instead of 5 stars is because the knob that switches from one air chamber to the other fell off somewhere and I lost it. You can still switch chambers you just have to turn the valve with your fingers or a small pair of pliers. I'm trying to find a knob online now. I highly recommend this product because I feel that the problem I had was probably a fluke as I've been fairly tough on the boot working and all. I broke my fibula and a doctor put me in this cast for 6 weeks. It's a great cast, absorbs a lot of shock when people accidentally bump into my foot or if I put it on the ground too hard. It's easy to pump and put on. Even with a broken leg, I can manage to put it on and take it off myself. I like it. Broke Right ankle and the Orthopedic Doctor put me in a cast for 3 weeks. Today the cast came off and he put me in this product. I've only been in this for about 6 hours but I love this Aircast. Forward mobility is now near normal. The hobbling I had with the cast and half steps are gone. I feel very secure in this and fully braced. I also love the way this has a the shock absorbing when walking as my heal in the cast was getting sore. I'd give it 10 stars if they let me.